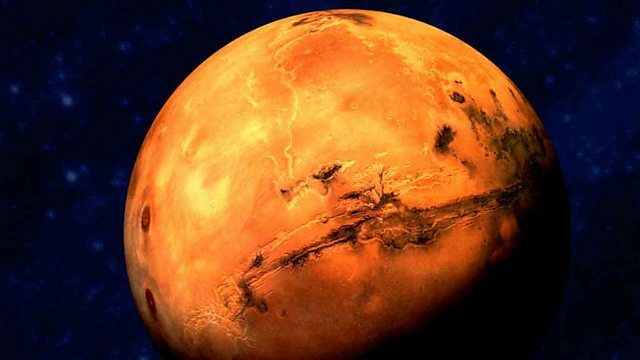 Melvyn Bragg and guests discuss the planet Mars. Named after the Roman god of war, Mars has been a source of continual fascination. Melvyn Bragg and guests discuss the planet Mars. Named after the Roman god of war, Mars has been a source of continual fascination. It is one of our nearest neighbours in space, though it takes about a year to get there. It is very inhospitable with high winds racing across extremely cold deserts. But it is spectacular, with the highest volcano in the solar system and a giant chasm that dwarfs the Grand Canyon.For centuries there has been fierce debate about whether there is life on Mars and from the 19th century it was even thought there might be a system of canals on the planet. This insatiable curiosity has been fuelled by writers like HG Wells and CS Lewis and countless sci-fi films about little green men.So what do we know about Mars – its conditions, now and in the past? What is the evidence that there might be water and thus life on Mars? And when might we expect man to walk on its surface?With John Zarnecki, Professor of Space Science at the Open University and a team leader on the ExoMars mission; Colin Pillinger, Professor of Planetary Sciences at the Open University and leader of the Beagle 2 expedition to Mars; Monica Grady, Professor of Planetary and Space Sciences at the Open University and an expert on Martian meteorites. A collection of programmes relating to planets, satellites and asteroids.